Lindeman's 2013 St George Vineyard Cabernet Sauvignon. that's rewardingly rich and generous in flavour. 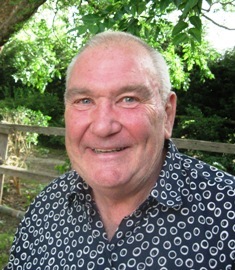 ONE TO NOTE: 2013 was an excellent vintage in Coonawarra, and on Lindeman's 12ha St George Vineyard the reds ripened slowly and fully to give winemaker Brett Sharpe wonderful fruit of excellent colour density, concentration of flavour and ripe tannin structure for the limited release 2013 St George Vineyard Cabernet Sauvignon. Already brimming with generous and rich blackcurrant flavour and savoury tannins, at $70 this is a great wine now but will simply get better over the coming five, ten or even more years. Put it on the table with a good steak, or simply enjoy it on its own. great fan and devotee of premium sparkling wine. ONE TO NOTE: PETER LOGAN at Logan Wines at Orange in the NSW Central West has long displayed a dogged commitment to evolve and improve his Logan Vintage 'M' Cuvee that's named in memory of his late father, Malcolm – a great fan and devotee of premium sparkling wine. Made in the traditional Champagne method, Peter's latest release is from the 2012 vintage and is interesting in that he's broken away from a usual practice of close to equal parts of Chardonnay, Pinot Noir and Pinot Meunier. For this one he's opted instead for a literally whopping 79% Chardonnay, 11% Pinot Noir and 10% Pinot Meunier , all off 18 year old vines growing in rich, deep volcanic soils on the north-facing slopes of the local Mount Canobolas. Crisp and dry with flavours of lemon, wild strawberry, almond and a salty minerality, this 2012 Logan Vintage 'M' Cuvee is a great drop at $35 for upcoming partying. any time up to 20 years down the line. IF you've an extra-special Christmas coming up and you are looking for an extra-special wine for just the two of you, give real consideration to Margan Wines' recently released 2011 Aged Release Shiraz. At $100 a bottle this is a unique wine you'll find is just the drop for a unique-occasion Christmas, especially if turkey is at the centre of the table: Andrew Margan created it using grapes from 40 year old Hunter Valley vines that yielded just a half tonne per acre of intensely flavour-concentrated fruit when picked at full ripeness. After fermentation it was given 20 months in new French oak barriques, then bottled and aged for four years in Margan's own cellars under Andrew's care. A beautiful dark purple in colour, this one screams classic Hunter Shiraz, with aromas of white pepper, ripe dark berry fruit, tar, a hint of cigar box and lovely follow-through flavours. And while Ideal for that special-occasion Christmas lunch or dinner turkey this year, it'll also mature beautifully over the next couple of decades for even greater enjoyment at Christmases or other special dining events down the line. No Australian Drinks Warm Beer, So Why Are 82 Per Cent of Us Drinking Red Wine Too Warm? In a recent IPSOS study conducted by Taylors Wines, 8 out of 10 Australians are drinking their red wine 'at room temperature'. While this may seem like normal behaviour, our warm Australian climate is actually having a negative impact on the flavour of our favourite shiraz, pinot noir or cabernet sauvignon. The temperature of an average Aussie home, particularly in summer, ranges between 22˚C-24˚C, and according to industry experts, including the Court of Master Sommeliers, serving a red wine at this temperature robs it of its finesse and flavour. This antiquated advice of drinking red wine at 'room temperature' originates from medieval French drawing rooms which were closer to a chilly 14˚C-16˚C. White wine isn't exempt from the harsh Australian sun either. While nothing may seem more refreshing than a crisp glass of riesling poured straight from the fridge, chilling a white wine too cold can mask its flavours and aromas, making its acid flavours more pronounced. In a recent Wine Intelligence survey commissioned by Taylors Wines, 77 per cent of Australians enjoy a cool glass of white fresh from the fridge, while 21 per cent even serve it directly from the freezer. Taylors Wines third generation Managing Director Mitchell Taylor says this is a dilemma that affects most Australian wine drinkers, they just don't know it yet. 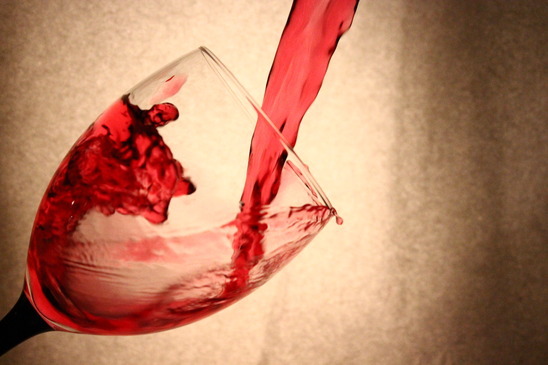 “Temperature is a vital piece in making sure wine is enjoyed at its very best. While our winemakers take great care to ensure our wine is of utmost quality and value, the warm Australian climate is not so great for storing and drinking wine,” Mitchell said. While expensive high-tech wine fridges and thermometers can be used to control and monitor a wine's temperature consistently, most Australians don't have access to this equipment, so Taylors have found a solution to wine drinker's temperature troubles with their latest label innovation. 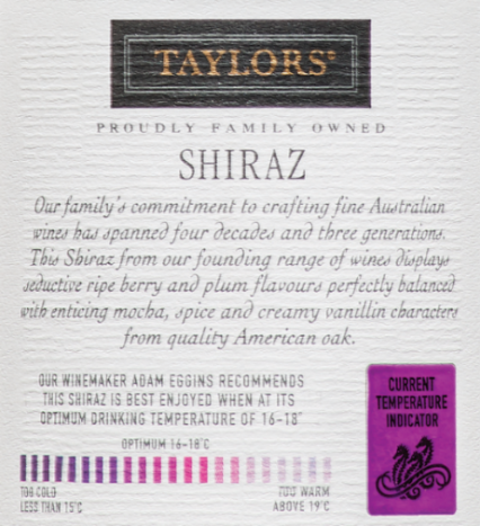 Now featured on the back of Taylors Estate and Promised Land ranges is the Optimum Drinking Temperature Sensor – a temperature sensor which uses thermo-chromatic ink technology that changes colour depending on the temperature of the wine, turning green when the white or sparkling wine is just right to pour, and turning fuchsia for the red wines. “Using insights and research into Australian wine drinking habits, we're excited to share a simple way for wine consumers to know when their wines are just right to drink,” Mitchell said. According to Taylors Chief Winemaker Adam Eggins, he suggests putting a red wine in the fridge 30 minutes prior to serving. This will give the wine time to chill to the optimum drinking temperature, turning the back label's small seahorse sensor to a bold fuchsia colour. As for whites, Adam suggests pulling a white wine from the fridge 30 minutes prior to opening and enjoying as this will give the wine enough time to warm up, opening the wines aromas and unique flavours. 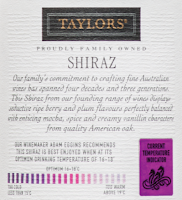 The Taylors Estate range of wines are available for RRP $20. The Taylors Promised Land range are available for RRP $15. Both ranges are available at all good liquor retailers throughout Australia and online at www.taylorswines.com.au. For more information about Taylors new Optimum Drinking Sensors, visit www.taylorswines.com.au/betterbydegrees. According to the latest findings from Roy Morgan Research, some 4.8 million Australian adults buy alcohol in an average seven days, spending almost $296 million between them (an average of $61 per person per week). Enjoying the largest slice of this rather substantial pie is liquor megastore Dan Murphy’s--leader not only in terms of market share, as it happens, but also in total customer numbers. In any given week, 1.2 million Aussies 18+ (or 23.9% of total alcohol-buyers) shop at Dan Murphy’s, spending an average of $67 each. The result? An impressive 26.3% share of total dollars spent on alcohol during an average seven-day period—well ahead of BWS (Beer Wine Spirits), which has 17.9% of the total weekly liquor spend. With 1.1 million people shopping there in an average seven days, BWS is only just behind Dan Murphy’s in terms of customer volume. However, because BWS customers spend considerably less on average ($48) than Dan Murphy’s shoppers, the difference in market share between the two retailers is more pronounced. Liquorland (10.8% of total market dollars), 1st Choice (6.3%) and wine clubs such as Cellarmasters and the Wine Society (4.8%) complete the top five liquor retailers with respect to market-share size. But where a retailer sits in term of market share does not always correspond with the volume of customers shopping with them in any given seven days. Wine clubs are the most striking example of this. While they account for the fifth-greatest portion of total dollars spent—thanks to their customers’ hefty $194 weekly spend— they don’t even crack the top 10 for customer numbers. Used by 74,000 Australian adults in an average seven days, these online retailers tend to specialise in bulk sales (eg cases of wine) rather than spontaneous one-off purchases. The opposite pattern is true of ALDI Liquor, which attracts the fifth-highest number of shoppers in any given seven days (251,000) but only 2.2% of total dollars spent due to their customers’ low average spend ($26). Given the low prices of ALDI Liquor’s products, this is not especially surprising. “These latest alcohol findings will come as very good news to Woolworths Limited, which owns both Dan Murphy’s and BWS, the retailers with the highest share of Australia’s liquor market—just over 44% between the two of them. “With its enormous, well-stocked stores, low-price policy and strong online presence, Dan Murphy’s also happens to be the current Liquor Store of the Month in the Roy Morgan Customer Satisfaction Awards. 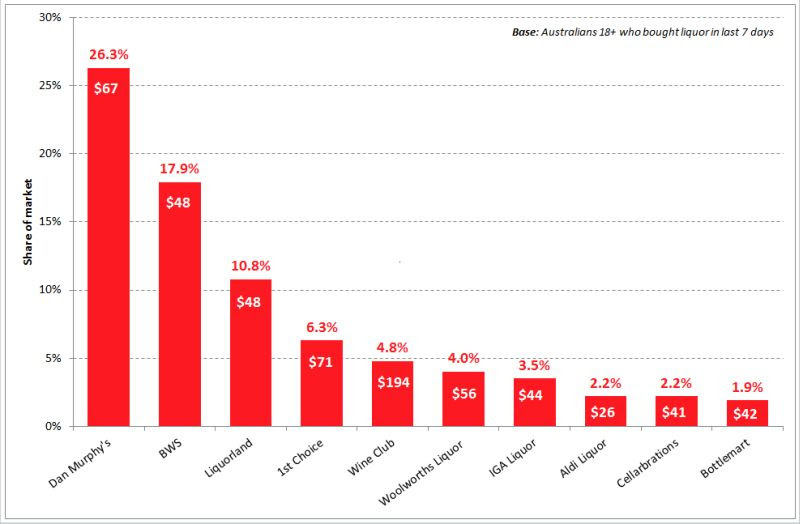 Clearly the chain is ticking all the right boxes among Australia’s alcohol buyers, who not only flock there in droves but rack up one of the higher average weekly spends. “BWS serves a different purpose, being geared more towards convenience with its stores located adjacent to Woolworths supermarkets. It is interesting to note that Woolworths also has a finger in the wine club pie with Cellarmasters, one of the country’s top online wine stores. Italian meatballs in a rich tomato sauce. ONE TO NOTE: IF you are among Australia's expanding ranks of Merlot lovers, a rewarding example from one of our major growing areas, McLaren Vale is Shottesbrooke Estate's just-released 2013 vintage. Soft and juicy on the palate yet with lovely bright red fruit flavours to the fore, coupled nicely with underlying dark plums, this is a great example as to why Merlot is so popular with those who enjoy a red that doesn't detract from any of the enjoyment of a meal's flavours. At $20 and with those red fruit flavours along with a touch of light oak and some fine and savoury tannins, this Shottesbrooke 2013 is just the drop to put together with Italian meatballs in a rich tomato sauce. to for the upcoming Festive party season. 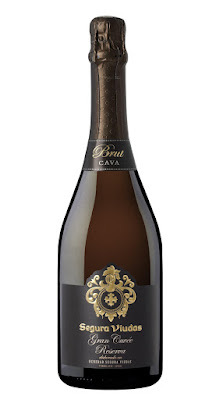 WITH the Festive Season not all that far away and attention turning to decisions about the bubbles to go with it, a label to give thought to for quality, price-value and as something of a talking point, is Spain's Segura Viudas Grand Cuvee Reserva. Hailing from the Penedes region 50km south of Barcelona – and one of the oldest wine producing regions in the world – Segura Viudas winery began life in the 11th century as a military watch tower, became a country mansion a couple of centuries later, spent time as a church, and finally in the 19th century evolved into a winery. Today it's part of the vast Freixenet wine company stable (the biggest sparkling wine maker in the world,) with its Grand Cuvee Reserva a great choice for entertaining or special-occasion dining – and interestingly 85% made from the traditional Spanish varieties of Macabeo and Parellada that give it wonderful fruit flavours, and the remaining 15% originally-French Chardonnay and Pinot Noir for lovely acid balance. Officially classified as a Cava, a Segura Viudas Grand Cuvee Reserva 2011 was made in the Methode Traditionelle, and at $25 is a perfect match served well-chilled with upcoming Festive Season aperitifs such as pate and honey-glazed prawns. pioneer and a great match with duck, veal or pasta dishes. ONE TO NOTE: SHAW Vineyard Estate at Murrumbateman in the Canberra District has really kicked some goals in its just-ten year existence, and another for its books is a just-released 2013 Reserve Merriman Merlot made from the very best of fruit that was hand-selected from low-yielding vines, and picked in the cool of night. Graeme Shaw has been producing Estate and Reserve label Merlots for many years – the difference being the extra time the Reserve spends in select French barrels – and has now added the moniker Merriman to his 2013 Reserve Merlot. That's because it's the name he gives to his best red of the year, and honours pioneer George Merriman who produced world-class wool from Murrumbateman land on part of which the cool-climate Shaw vineyard now thrives. At $60 with lovely varietal plum and black cherry flavours, savoury tannins and a long finish, this is a great drop with duck, veal or pasta dishes, or mild-spiced curries. love their wines – or even for yourself. IF you're starting to wonder about an ideal Christmas gift for that VIP relative or friend just getting into the appreciation of quality wines – or is already there and wanting to further increase their knowledge – look no further than Rob Geddes' Australian Wine Vintages 2016. This great little 33rd edition of what's more-popularly dubbed "The Gold Book" is an absolute treasure trove of information as it showcases the top 10% of Australian wineries, and gives detailed tasting notes, assessments of vintage qualities, and indicative pricing of an amazing 6,000-plus wines from 300 Australian wineries – forty of these latter being new first-time inclusions. 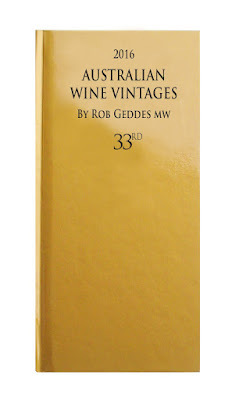 Rob Geddes cleverly demystifies the wine buying and enjoyment experience in this pocket-size book (and which is also available on app,) and as well as current vintages looks at selected past years for those already into, or maybe thinking of beginning a cellar. A really must-have both for the new-into-wine and the already-established, it's a worthwhile $34.95 from www.thegoldbook.com.au, with free delivery before Christmas for that special relative, friend – or yes, yourself. The 18 Trophy-winning wines and winemakers in the 2015 Pier One Sydney Harbour NSW Wine Awards were presented with their highly-coveted awards at a sold-out Presentation Lunch at Pier One Sydney Harbour, attended by the who's-who of the wine industry, media and NSW Government. With judges awarding a record number of gold medals in this year's NSW Wine Awards, competition for trophies was especially tough. The trophy winners represent the very best of the best. And it is from these latter 4 top trophies that the ultimate title of 'Pier One Sydney Harbour 2015 NSW Wine of the Year' has been meticulously chosen and will be awarded to … 2014 Nick O'Leary Wines Shiraz. 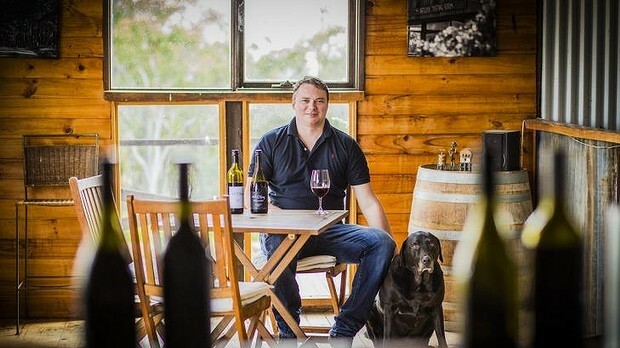 This is a great success for Canberra District based winery Nick O'Leary Wines and even more impressive when noted that a Nick O'Leary wine won the 2014 Wine of the Year Trophy! The first time a winery has won back-to-back Wine of the Year Trophies. President of the NSW Wine Industry Association and Awards judge Tom Ward said, "Nick O'Leary and the Canberra District wine region can deservedly celebrate this weekend with another outstanding achievement. And the rest of the State has a lot to be happy about too with the 2015 trophies going to 7 different wine regions in total and again showcasing the quality and diversity of wines available from all over NSW." Over the 20 years the NSW Wine Awards has been running, there has been a continual increase in interest in the Awards from wine producers, wine sellers, the public and new corporate sponsors, signifying the real support for our local wine industry and its connection with both tourism and food. This interest has been backed by a continued increase in sales of NSW wines in the domestic market, especially in Sydney. WITH Australians in recent years taking more and more to lighter and more savoury red wine styles in our warmer months, we're also doing something that was almost unthinkable even just a few years back – we're actually putting these reds in the fridge to give them a bit of a chill on serving. And we're realising just how enjoyable they can be, with one maker who is openly advocating the concept of refrigerating lighter reds being the Clare Valley's Tim Adams, who has just released a 2015 Novo (New) Sangiovese under his Mr Mick label, a wine he says is "a quality alternative to Rosé" and nicely priced at $17. Sangiovese is the most-planted red variety in its homeland Italy, and is the backbone of that country's famous Chianti that traditionally contains anywhere between 75% and 100% Sangiovese, with quite a wide range of other varieties making up the rest. Tim Adams' 2015 Mr Mick Novo Sangiovese is a wonderfully easy-going wine that's all about flavours of red berries – cherries, strawberries and raspberries – mellow tannins and with a nice clean and dry finish. And yes, do pop it in the fridge in our coming warmer months to give it a nice bit of chill… with its acidity, herbaceousness and savoury notes, it's a natural to enjoy with – what else? – a pizza with loads of tomato, cheese and herbs, and if you're a carnivore, plenty of pepperoni.